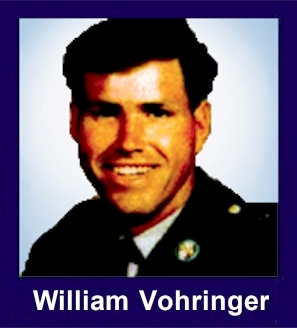 The 35th Infantry Regiment Association salutes our fallen brother, SSG William Thomas Vohringer, who died in the service of his country on March 15th, 1970 in Pleiku Province, Vietnam. The cause of death was listed as Rocket/Mortar (DOW in California Hospital). At the time of his death William was 26 years of age. He was from Vincetown, New Jersey. William is honored on the Vietnam Veterans Memorial at Panel 12W, Line 2. The decorations earned by SSG William Thomas Vohringer include: the Combat Infantryman Badge, the Bronze Star with V, the Purple Heart, the National Defense Service Medal, the Vietnam Service Medal, the Vietnam Campaign Medal and the Vietnam Cross of Gallantry with Palm Unit Citation. William was wounded in a mortar attack on 12/15/69 and died at Letterman Hospital, San Francisco. William Thomas Vohringer, referred to as "Country", a nickname he received from his fellow soldiers while in Vietnam, was born May 6, 1943 in Camden, New Jersey. William is the son of Catherine G. Gumbrell and Otto Robert Vohringer. He had nine brothers - Robert, George, Otto, Ernest, Charles, Neil, James, Richard and Kenneth - and five sisters - Jean, Catherine, Alice, Susan and Gloria. William graduated from Lenape Regional High School in Medford, NJ in 1961. Soon after, William entered the US Army and began his tour in Vietnam on November 7, 1969. Vohringer attained the rank of Staff Sergeant (SSGT/E6) and served in Company A, 1st Battalion, 35th Infantry, 4th Infantry Division. On December 15, 1969, Vohringer was hit by mortar fire while in combat in South Vietnam and died from his wounds on March 15, 1970. He is listed as killed in action. He left behind his fiance, Prisicilla Colantro, in San Francisco, CA. His family laid him to rest at Greenwood Cemetery in Millville, NJ. Vohringer received a Bronze Star with V Device, Purple Heart, Good Conduct Medal, Infantryman Badge, National Defense Service Medal, Vietnam Service Medal and Vietnam Campaign Medal.